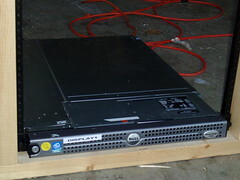 After my debacle with the 1U servers I bought (see my previous post), I went by a local technology recycling center and picked up a couple of off-lease Dell Poweredge 1750s. It's what I should have done in the first place. Anyways, I decided a few weeks ago that I wanted to mount these servers in a rack. I wanted it to be mobile and easy to move as moving is something I have been very familiar with over the last few years. After not finding what I wanted anywhere, I was able to find rack rail at zZounds (a music store that I've ordered guitar stuff from before). So I decided to do it myself. The first step was to understand the measurements of a 19" rack. Originally designed to hold railroad signal switching relays, 19" rack measurements are specified by EIA-310-D. The strips from RaXXess are standard rack rail at 0.625" in with. They are mounted at 19" apart from the outside of the rails, giving a distance between the inside edges of the rails of 17.75". The depth isn't specified, so I decided to make mine 30" deep. After that, it's just cutting! It took 4 2x4's at 10ft and a sheet of plywood. 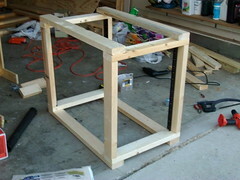 The pictures below will explain better than I can in words the process of building this thing. The first step was measuring and cutting. This was actually the most tedious part of doing this whole thing was getting the measurements right - as Dad always said, measure twice, cut once! 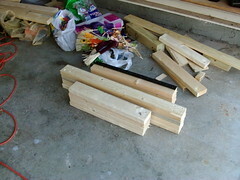 I cut four 24.5" pieces, four 22" pieces, and four 36" pieces. 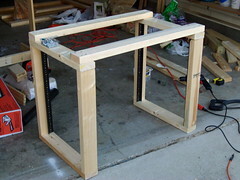 Here's the completed frame 1, with a Dell Poweredge 1750 in to test and be sure that I had the measurements right. 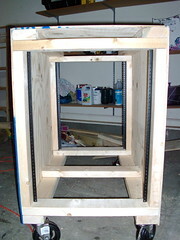 The rails had been mounted on the inside towards the back of the frame to give the server face some protection. 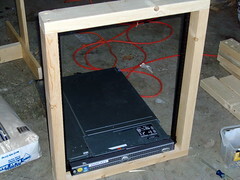 Closeup of the server in the frame. Adding the top and bottom pieces now. Mostly complete. By now you can see what I'm aiming for. And here's the finished product! 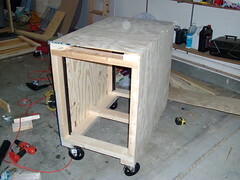 I added plywood sides and casters to roll it around. The total cost was about $100. The most expensive items were the rails (which came in at about $50 shipped) and the casters (which were $20 for four locally from Harbor Freight). After that, it took me about four hours cut and put everything together. It's not quite finished yet - I want to add doors to the front and back to ease transport a little bit as well as handles on the sides to make it easier to lift in and out of a truck. I haven't put the servers in it yet - I'm waiting for rails to come in for the servers since they didn't have any where I bought them from. I'm also thinking about slaping a coat of paint on it to make it look a bit better. Otherwise, it's pretty sweet!